The Browns signed quarterback Joel Stave on Monday, per a team announcement. To make room for Stave and other signings to come, they waived wide receivers Matt Hazel and Kasen Williams and free safety Kai Nacua. Stave, a 6’5″ QB, first entered the league with the Vikings in 2016 as an undrafted free agent. Since then, he’s made stops with the Vikings, Seahawks, Chiefs, Redskins, and the Jets. GM John Dorsey was at the helm in Kansas City two years ago when the Chiefs signed Stave, so he’s curious enough to check in on him. Stave finished his career Wisconsin’s all-time winningest quarterback (31-10 record), but he remains untested at the pro level. He also faces long odds of making the final cut in Cleveland with Tyrod Taylor, Baker Mayfield, and Drew Stanton ahead of him. Williams was one of the standouts of the 2017 preseason when he reeled in nine catches, 208 yards, and one touchdown for the Seahawks. Seattle tried to sneak him through waivers in order to sign him to the practice squad, but the Browns jumped at the chance to sign him to the active roster. Kasen Williams became one of the preseason’s success stories. The Seahawks wanted to pass the wide receiver through to their practice squad then, but the Browns swooped in and signed him to their active roster. Williams had nine catches for 84 yards in seven games for Cleveland, but spent the rest of the year on the taxi squad. The old regime had some interest in Williams, but Dorsey no longer sees a spot for him on the expanded roster. The Browns announced that they have officially re-signed exclusive rights free agent Josh Gordon. In addition to the star wide receiver, the Browns have also formally re-upped wide receiver Matt Hazel, offensive lineman Austin Reiter, and fullback Danny Vitale. All four players are set to take part in the team’s offseason program, which started on Monday morning. Gordon should have been an unrestricted free agent by now, but multiple suspensions caused his contract to toll. As a result, Gordon did not have any options this offseason and the Browns had full control over his rights. Gordon, 26, appeared in five games for Cleveland in 2017. In that time, he posted 18 receptions for 335 yards and one touchdown. This year, he’ll play alongside Corey Coleman and the newly-acquired Jarvis Landry. If Gordon is able to stay on track, he could thrive as a deep threat in the Browns’ revamped offense. 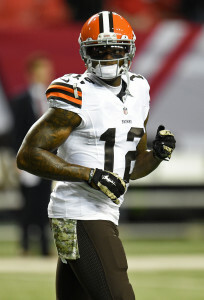 Gordon first joined the Browns as a second-round pick in the 2012 supplemental draft. All in all, he has appeared in 40 games and recorded 179 receptions for 3,089 yards and 15 touchdowns. In 2013, he led the league with 1,646 receiving yards.